Terex, one of Caterpillar’s smaller competitors in the mining and construction equipment space, took such a royal pummeling yesterday that I figure it’s worth mentioning even if it makes me look like a slacker for not blogging the news as it happened (you get what you pay for in the blogging business). The real news started after the bell Wednesday, when the company reported a huge loss and said it expected mass layoffs. It got worse yesterday when an analyst noted the company is in danger of violating a covenant on debt due in April. Terex lost a third of its value in the space of 24 hours (though it was up a few percentage points this morning). 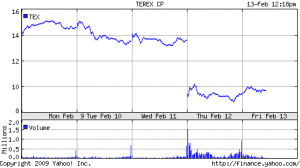 You have to wonder what Terex investors were thinking up until the day before yesterday. Cat shares were off by a third from their December high to their February low; it’s hard to imagine TEX avoiding a similar fate. Ah, that old “lack of earnings guidance” bugaboo: it’ll bite you every time. Perhaps TEX investors did not expect the company to take a $460 million Q4 loss for “goodwill impairments in the Construction, Roadbuilding and Utility Products businesses, where the recorded value of those assets exceeded their fair value due to lower projected results for these businesses resulting from adverse market conditions.” Goodwill losses don’t affect cash flow much, though lowered asset values would mean less collateral to borrow against. More on TEX at Finviz. WASHINGTON — Commerce Department releases housing starts for January, 8:30 a.m.; Federal Reserve releases industrial production for January, 9:15 a.m.; the Federal Open Market Committee releases minutes from meeting held in January, 2 p.m.
NEW YORK — CBS Corp. reports fourth-quarter financial results. PHILADELPHIA — Comcast Corp. reports fourth-quarter financial results. MOLINE, Ill. — Deere & Co. reports first-quarter financial results. AKRON, Ohio — Goodyear Tire & Rubber Co. reports fourth-quarter financial results. PALO ALTO, Calif. — Hewlett-Packard Co. reports first-quarter financial results. AUSTIN, Texas — Whole Foods Market Inc. reports first-quarter financial results. Cummins, a key Caterpillar competitor in diesel engines and power systems, reported today that its fourth quarter profit fell 55 percent and it plans to cut its workforce by 6 percent this quarter. Solso, chairman and chief executive, said in a statement. Sales fell 6 percent to $3.29 billion. Layoffs should total about 800, the company said. Cummins expects sales in 2009 to be approximately 20 percent lower than 2008, and to earn an EBIT margin of 6.5 percent of sales, excluding restructuring costs associated with the actions announced in the first quarter of 2009. Sales are forecast to drop across all business segments, with the largest decline expected to come from the Components and Engine segments. All business segments, however, are expected to be profitable in 2009 and the Company will continue to aggressively reduce costs while investing in key growth opportunities. Well, they’re keeping their chins up. Noteworthy tidbits from the release: sales to Chrysler for its pickup trucks are down 34 percent and sales to RV manufacturers are off 72 percent. More on Cummins at Finviz. Komatsu, which competes with the world’s No.1 Caterpillar Inc., said it now saw an operating profit of 200 billion yen ($2.3 billion) for the year to March 2009, down from its previous profit estimate of 300 billion yen. That would be down 40 percent from the previous year and lag the consensus estimate in a poll of 16 analysts by Reuters Estimates of 273.7 billion yen. “This is not good for its stock price,” Hidehiko Hoshino, an analyst at UBS, said. This is the main reason Caterpillar’s stock got beat up at the open, though you have to ask yourself: with Cat in the same boat as everyone else and earnings to be announced before the bell Monday, would you want to be holding Cat over the weekend? CNH — the merged construction/agricultural equipment giant perhaps better known as Case New Holland — disappointed the markets with its earnings outlook today. At one point shares were down 30 percent. Notably, CNH would not offer guidance for this quarter. Wall Street hates that. CNH said it expected the weakness in construction equipment sales that dogged the industry in 2008 to continue into 2009 in all major markets, including “significant declines in Western European and Latin American markets.” It also warned that the many infrastructure investment projects being unveiled around the world to pull local economies out of recession would do little to increase demand for new equipment. “Although unprecedented levels of governmental stimulus actions are being enacted throughout the world, we expect that such actions will have an impact in late 2009 or possibly into 2010, and may only serve as an offset to new declines in other construction equipment market segments,” CNH said in a statement. Caterpillar, which reports earnings Monday, was down as much as 7 percent this morning. More on CNH at FinViz. Reuters: U.S. manufacturer Cummins Inc (CMI.N) said on Tuesday it would cut its permanent professional workforce worldwide by at least 800 and reduce its top executives’ pay by 10 percent next year in an effort to reduce costs in the face of a deepening global recession. Market Watch: J.P. Morgan reduced its rating for Deere Co. to neutral from overweight on Tuesday, saying farm equipment sales appear to have already peaked. In a note to investors, the financial firm said corn prices look poised to fall, threatening to weaken farmers’ purchasing power and countering its earlier prediction that lower South American crop production would keep prices firm. Normally we’d cheer tough times for the competition, but these ain’t normal times. Hitachi Construction Machinery will freeze plans to build $1 billion worth of new plants in China and Asia, Bloomberg reports. The effects of the global financial turmoil have spread to China and emerging nations, where Hitachi and rival Komatsu Ltd. previously expected sustained growth to mitigate sales declines in the U.S., Europe and Japan. As recently as Oct. 28, Hitachi was expecting 26 percent growth in China sales this fiscal year. Now Hitachi has suspended a plan to boost output capacity in China by 25 percent to 15,000 units after the excavator market there shrank 50 percent in November and 37 percent in December from prior year levels. China’s 4 trillion yuan ($585 billion) stimulus package, which aims to expand road and railway infrastructure, won’t likely benefit the industry as quickly as executives at Hitachi initially hoped, with the market expected to shrink next fiscal year, Kikawa said. Asia’s two largest makers of earthmovers are halting overseas expansion and shedding temporary jobs, and their bigger U.S. rival Caterpillar Inc. is cutting executive pay as much as 50 percent to pare costs. Hitachi was last seen here last week with a gloomy forecast for excavator demand. I can’t help wondering about the two new facilities Caterpillar has announced in the past four weeks. Anybody else remember the steel skeleton that stood for years next to Interstate 74 when the Morton parts plant expansion got stopped dead in its tracks by the early 1980s recession? The worldwide market will shrink 15 percent to 17 percent in the year to March 31, worse than the 6 percent forecast in October, Chief Executive Officer Michijiro Kikawa said today in an interview in Tokyo. Demand may slide 10 percent to 20 percent in the next fiscal year with “no sign of a recovery,” he said. Waning sales are forcing Hitachi Construction and bigger rival Komatsu Ltd. to reduce workers, freeze expansion in Asia and slash output. The global financial crisis has spread to the construction industry, triggering a sudden decline in sales in China and emerging markets. Hitachi is Asia’s second-biggest machinery maker after Komatsu. Can’t be too long before we get rumblings like this from Caterpillar. Fourth-Quarter earnings are out Jan 26. It stands to reason that Caterpillar has a nice order backlog in some areas that should tide the company over through a few rough patches. Orders can be canceled, though.